The Core curriculum is a student’s introduction to the tools of inquiry used in every discipline—science, mathematics, humanities, and social sciences. Through a partnership with the Marine Biology Laboratory in Woods Hole, Massachusetts, and Ben-Gurion University of the Negey in Beer-Sheva, Israel, UChicago has expanded its programs in marine biology, clean water initiatives, and undergraduate research opportunities. UChicago is one of only two universities that manages two national Department of Energy Laboratories—the Argonne National Laboratory and Fermilab. 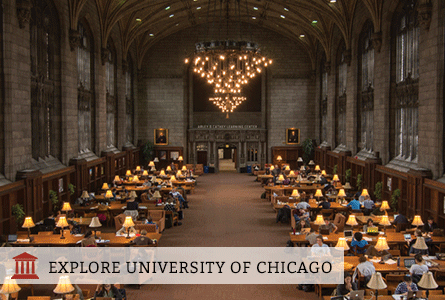 The University of Chicago Library has six locations on campus, holding 7.9 million printed volumes, and increasing at a rate of 150,000 volumes a year. The College offers over 40 quarter- and year-long study abroad programs in 20 countries. There are more than 89 Nobel Laureates associated with the University—about 10% of all the Nobel prizes that have ever been awarded.